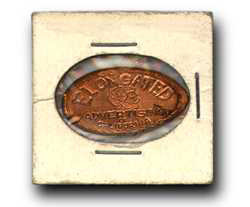 Smashed pennies, also known as elongated coins (they're not just limited to pennies), are great! The reason they're so great is that they're cheap, they're small, and since machines are usually hidden away you have to leave it up to serendipity to find them. My collection started with just a few pennies, but now has ballooned to more than 1000 at last count. Most of them are documented here. This site was started in late 1997, and at this point is about the longest running, still-being-updated (yes I know, updates are pretty infrequent) web site about elongated coins out there. I hope you like the collection, feel free to link to the site, or write me with your comments. Check the New Arrivals for updates from Chicago, Milwaukee, Pittsburgh, Los Angeles, San Francisco, and other places with high pressure situations.